Lucy Gunning works with film, video and performance. 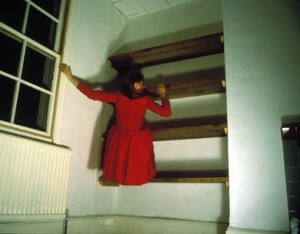 She became known for her video piece Climbing Around My Room (1993) which shows a female figure in a crimson dress attempting to find her way around a room, using only its furniture and architectural features to ensure that her feet never make contact with the floor. It describes something pleasurable, a bit dangerous and rather fun. In another video work, The Horse Impressionists (1994), she filmed five women doing realistic imitations of a neighing horse. Some of the women forget the camera and embrace acting out guttural, animal-like sounds. In this and subsequent works the focus is on the human voice; but both works touch on some fundamental memory, of playacting as a child, and the seemingly impossibility of ever being given permission to behave like a child again.